avondaleautomotive has no other items for sale. EASY INSTALL, BUT WOULD LIKE THE FOAM SEAL ON INTAKE OPENING AS ORIGINAL HAS. New in box as advertised, exactly what I need. Great seller! Great seller. Great product . Recieved my product within 2days . Thank you. You can buy a very expensive conventional aftermarket cold air intake for your car. In fact, Mopar has its own version made in the similar style as K&N or Airaid, or other similar products... 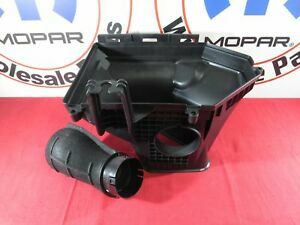 But if you own a Dodge Challenger made in 2015 or older you should take advantage of the design allowing your car to breathe through its inboard headlight and forever car air straight into your airbox by buying this set up. I have a 2017 GT with a V6 and installed this $100 solution in it. First if all, it's very cool to have a bit of a hellcat in my car.... Though I have no allusions that it is anything close to that magnificent beast; however, the car breathes much better and the sound it makes when pushed is testimony to the fact that a lot of cold air is getting into the motor. I am pleased with the purchase and recommend it to any other of a post 2014 Challenger regardless of powerplant. This was a very straight up install. Seriously a couple screws, move the airbox lid, pull out the bottom box, swith out a grommet & plug from old to new, pop out the center garnish plot from the inner halo light, add in toke tube to the new bottom, install new box w/tube in stock location, put the screws back...Ta-da..sickest stock intake on a challenger! Highly recommended. .it's sick! Watch a couple you tube videos and you'll be amazed at how simple it is! NO you don't loose a headlight, or do any wiring!! it's just replacing the bottom half of the factory airbox with a factory opar) Hellcat bottom box! Bam! Swapped my srt392 intake for this one. 4 screws and a hose clamp. Within minutes I was done. Cant go wrong with a drop in filter for it. Definitly a noticeable temp difference and slightly better exhaust note. I have Flowmaster American Thunder super44 catback exhaust system, and this intake was a nice add to the car because 1) I feel good about having my car breath air thru the cool looking vent in the headlamp 2) It's made a noticeable difference in the sound of the car. It sounds much deeper than before. Hell cat air box was easy to install. All oem parts. When installing, loosen up the rad over flow tank. (You do not have to remove it ) this makes it easier to install. You can add foam to the bottom of the air box and the tube to make a good seal.